Last night I went to the beach with the intention of getting a bucket of sea water for salt making. When I arrived I couldn't believe what I was watching. I saw hundreds of birds flying all around and diving into the water right off shore. These birds were gannets. A gannet is a very large sea bird similar to a large gull but larger. The interesting part about gannets is that they typically flock up when there are herring present. They all fly up in the air together, locate a school of herring and then proceed to dive bomb the fish like a squadron of kamikaze pilots. It's truely a 'National Geographic' type event when you see it live. These birds dive into the water from a hundred feet up and then swim underwater attacking the school of fish. Amazing to see. I tried to take a video of it but it was so cold and windy and I only had my phone camera. You can get a glimpse in this video but there's nothing like seeing it in person. Once again, the SDC gets me out off the couch, out of the house to do one thing (like getting a bucket of sea water) and I happened upon something pretty spectacular in nature. Pretty cool. I got my bucket of seawater and I also met a nice fisherman on the beach who gave me some pretty good information. He said that he caught a small striped bass about five minutes ago and he was telling me all about the birds. Then he went on about some other close-by freshwater fishing opportunities that I might take advantage of in the near future. I tried a few casts with a fishing lure but it was so cold and windy that I didn't last long. Not to mention that I snapped off my $12 fishing lure while trying a really long cast. After having half a trout and rice for dinner, I filtered the seawater and put it into a large stainless steel pot and boiled it down for about five hours before going to bed. I still have some boiling to do that I can finish up later. It sure will be nice to add some sea salt to my trout. I'm also thinking about trying to stockpile some trout fillets and dry smoking them to last longer. Perhaps it's time to invest in a legitimate smoking grill rather than the makeshift grills I have been using for the past few years. We'll see. Most of this post is from the evening of Day 3 so I thought I would add a little bit on Day 4 as well. Today was a long work day in which I brought a trout fillet and some rice with me to cook at lunchtime in the convection oven. 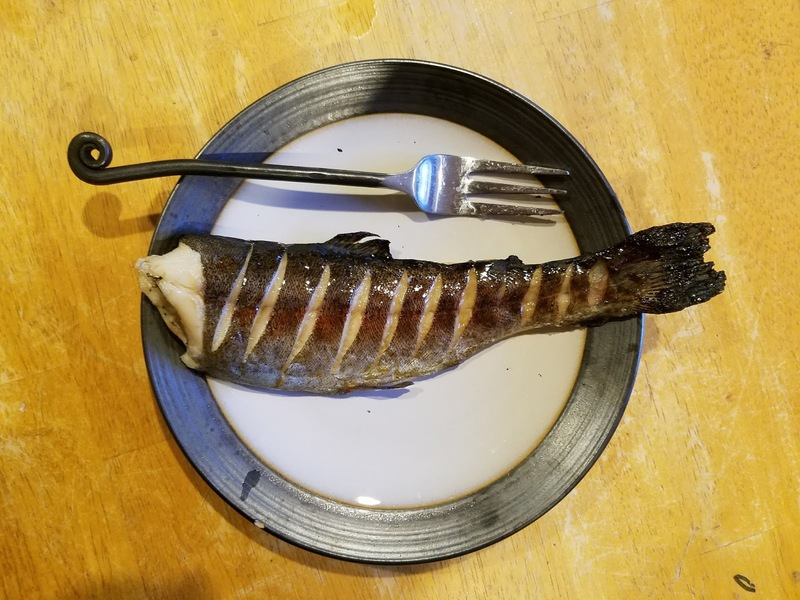 I followed this up with another half trout broiled with rice for dinner. Still a bit bland but it's just nice to have some fish to eat compared to previous SDCs. I can remember all too well not having any fish and not being able to catch one no matter how hard I tried. This is bordering on too easy. Another positive about having abundant fish is that it frees up my time and creative thinking in order to continue to evolve and come up with new ideas and plans. Tomorrow I am going clamming - weather permitting. The tide is low around noon so it should work out as long as it's not too cold. I should prepare for that. I was thinking about clams and how to preserve them for a long while. If I get a lot (which is what I expect) then I want to be able to keep them alive for several weeks - well beyond the closing of clam season which is the end of April. I talked to a friend who uses a small aquarium aerator and a cooler to keep clams alive in his garage for quite a long time. I may try that method and additionally turn over the water in the cooler every other day in order to make sure the clams do not sit too long in their own waste. In the past when I dug up a lot of clams I can remember several of them dying in the refrigerator after a week. I also remember getting sick of clams because that's all I had to eat for the first weeks. By preserving them longer I can eat less, not get tired of them and also have them for a much longer time. Forward thinking. That's what this SDC has been about for me so far. Learn from past successes as well as failures and keep moving forward. 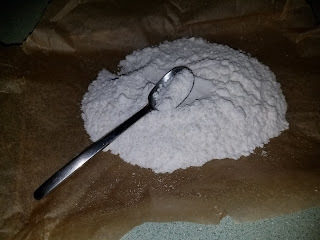 I finished my salt tonight. A large pot full of seawater yields about a cup and a half of salt. Can't wait to try it out on my fish tomorrow. I made a video of the salt making process that I will try to compile and post in the next couple of days when I have the time.